Interfaces that allow data to be exchanged with other programs are nowadays an absolute must for software packages like CONVAL®. CONVAL®'s entire functionality can for this reason also be made available to other applications via a COM (Component Object Model) interface, a standard developed by Microsoft for its Windows operating system. CONVAL® users are thus able exchange data between programs such as Excel, Access, Word, etc. on the one hand and CONVAL® on the other. 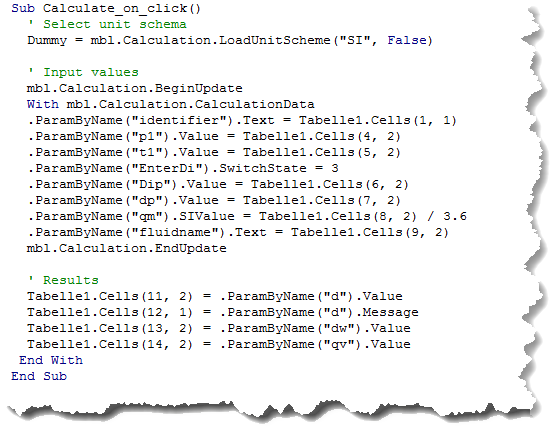 Sample calculations are installed together with CONVAL® (in the DEMO version too). Experienced Excel users used to work with macros e.g. may easily automate their Excel sheets with using CONVAL® calculations. Numerous suppliers of CAE systems as Prodok from Rösberg or comos pt from Siemens have already used this interface to integrate CONVAL® deep down in their systems. In the same way, CONVAL® can also be integrated, for example, as a design tool in the product and service range of hardware manufacturers, a strategy Bürkert is currently pursuing for its international valve sales.